Reigning Turkish Airlines Euroleague champion Olympiacos Piraeus sent a message that echoed all around Top 16 Group F by edging Montepaschi Siena 67-68 on the road on Thursday. The two teams are now tied for second place in Group F, each with a 7-4 record. Kostas Papanikolaou and Kostas Sloukas paced the winners with 11 points apiece. 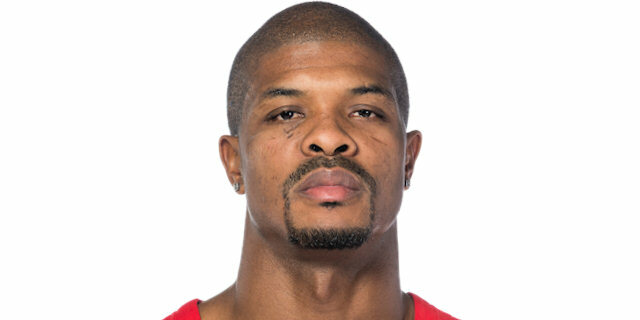 Kyle Hines and Vassilis Spanoulis each scored 10 for Olympiacos. Hines added 11 rebounds for a double-double. 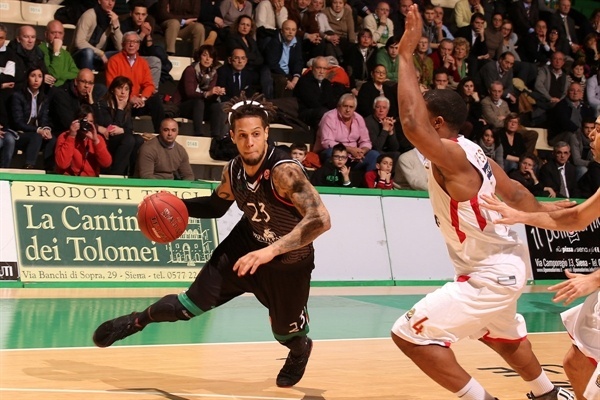 Matt Janning and Kristjan Kangur led Montepaschi with 14 points apiece. David Moss added 11 for the hosts. Acie Law shined early to give Olympiacos a 4-12 margin. Montepaschi improved its defense and a triple by Janning gave the hosts their first lead, 18-17, after 10 minutes. 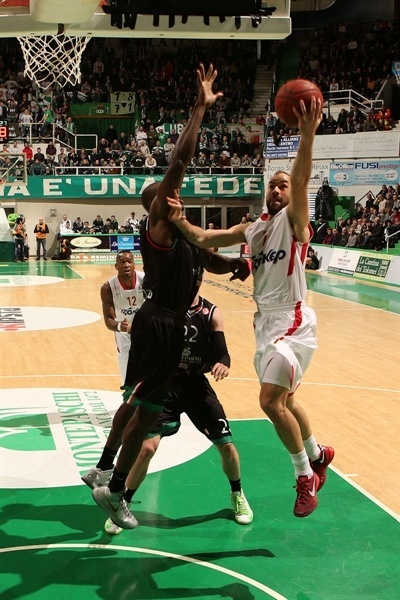 Janning kept pushing Montepaschi and a layup by Benjamin Eze made it a double-digit game, 36-26. 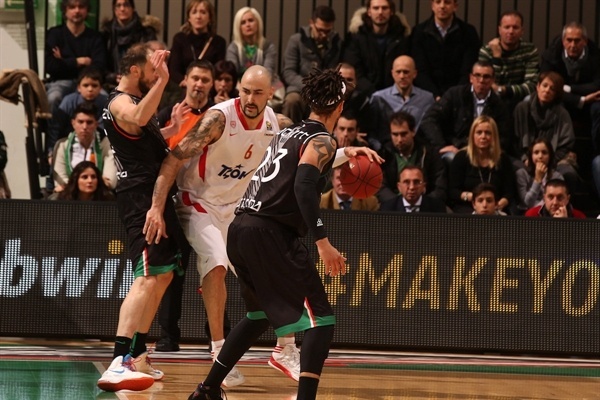 Pero Antic and Spanoulis brought Olympiacos as close as 37-36 at halftime. Outstanding defense allowed Montepaschi to grab a 53-44 edge late in the first quarter. Papanikolaou and Spanoulis struck from downtown in a 1-12 run that put Olympiacos back ahead, 54-56. A layup-plus-foul by Spanoulis seemed to seal the outcome, 61-68, but three-pointers by Janning and Moss brought Montepaschi within 67-68 already in the final minute. Montepaschi had a chance to win the game but did not get a shot up in the final seconds, allowing Olympiacos to celebrate a big win. Papanikolaou got Olympiacos going with a power layup off the baseline. Janning beat Spanoulis in the low post, but the champs' superstar took revenge with free throws. 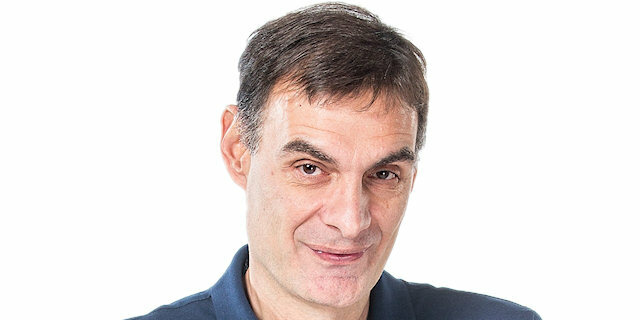 A fast break layup by Law soon gave Olympiacos a 2-6 lead. 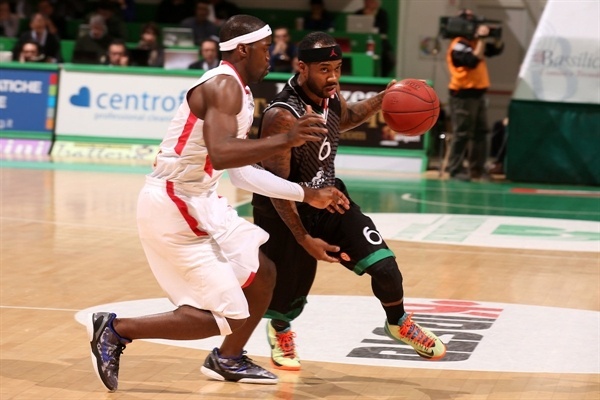 Montepaschi could not find the way to the basket and Law scored again to cause the hosts to call timeout at 2-8. Janning shined with a driving layup, but Giorgi Shermadini erased it with free throws and added a put-back slam to boost the Reds' margin to 4-12. Kristjan Kangur stepped up with a three-pointer and a close basket by Moss ignited the crowd at 9-12. Kangur kept pacing Montepaschi with free throws, which Papanikolaou improved on with a triple, good for an 11-15 Olympiacos edge. Bobby Brown took over with a driving basket, Shermadini made foul shots and Benjamin Ortner kept the hosts within 15-17. A three-pointer by Janning gave Montepaschi its first lead, 18-17, at the end of the first quarter. Kostas Sloukas took over with a second-chance layup early in the second quarter. 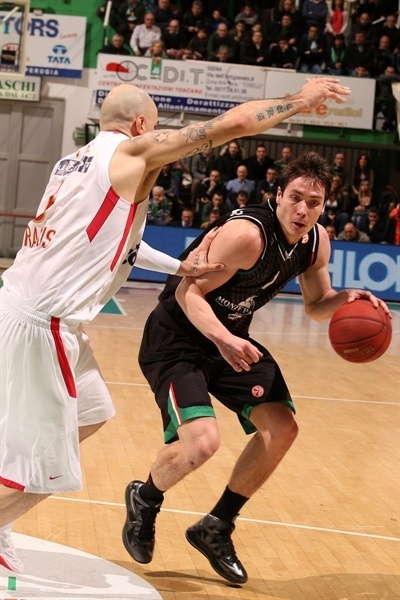 Kangur made free throws, as Montepaschi had adjusted its defense with him and Viktor Sanikidze under the baskets. Stratos Perperoglou made foul shots, but Kangur buried a three-pointer from the top of the key and Sanikidze dunked for a 25-21 Montepaschi lead. Hines provided a highlight with a high-flying slam, but Daniel Hackett did even better with a bomb from downtown. Hines finished a great Olympiacos offense with a layup only to see Marco Carraretto find space for a wide open three-pointer. Olympiacos could not get Spanoulis involved due to Janning's outstanding defense. Law split foul shots, Janning struck from downtown and a third-chance layup by Eze made it a double-digit game, 36-26. Pero Antic nailed a corner triple and a put-back layup by Hines caused the hosts stop the game at 36-31. Janning split free throws, Antic nailed another three-pointer and a jumper by Spanoulis brought the guests within 37-36 at halftime. Both teams struggled to score after the break until Eze stepped up with a power layup - and the free throw that came with it. Antic shined with his third three-pointer, as Olympiacos couldn't get Spanoulis to play one-on-one. Brown hit a floating layup and Eze made it a four-point game. 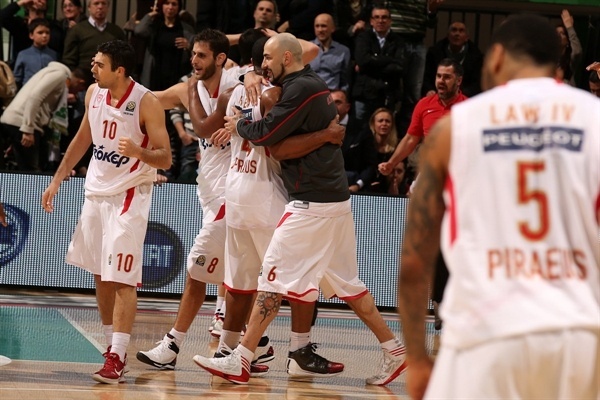 Spanoulis returned to the bench with 3 fouls and the Reds' offense collapsed. Meanwhile, Kangur scored down low and a long jumper by Brown forced the Reds to stop the game, 47-39. Sloukas nailed a big triple, but he didn't find much help around. 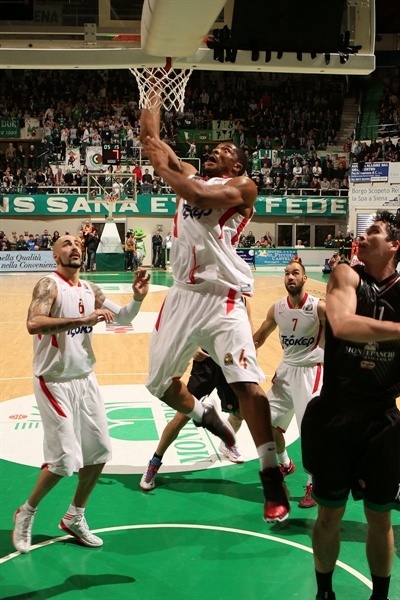 Moss stepped up with a corner three-pointer and a put-back layup by Shermadini gave Olympiacos some hope at 50-44. Brown and Ortner made free throws. Spanoulis returned to the floor late in the third quarter. He fed Papanikolaou for a three-pointer and a fast break layup by Law kept Olympiacos within 54-49 at the end of the third quarter. Hines scored around the basket early in the fourth quarter. Montepaschi was held scoreless for more than two minutes and another layup by Hines forced the guests to call timeout at 54-53. Spanoulis buried a three-pointer to complete his team's comeback, 54-56, but he had picked up his fourth foul on the previous play. Hackett fed Ortner for an easy basket, but a jumper by Sloukas put the guests back ahead, 56-58, with six minutes left. Papanikolaou nailed a triple that hit the rim, went up and fell down. Kangur rescued the hosts with a put-back basket, but no more points were added in the next two minutes. 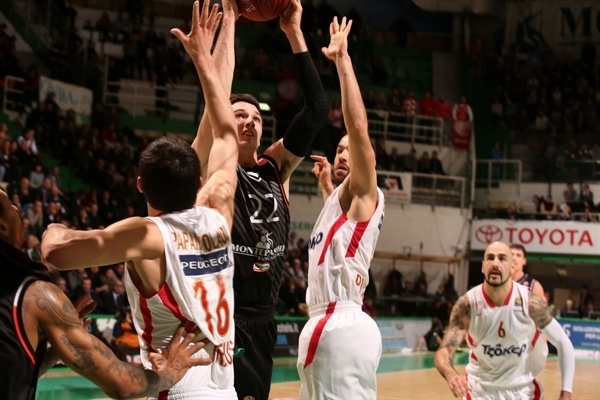 Spanoulis found Sloukas for a backdoor layup and a three-pointer by Moss kept Montepaschi within 61-63. 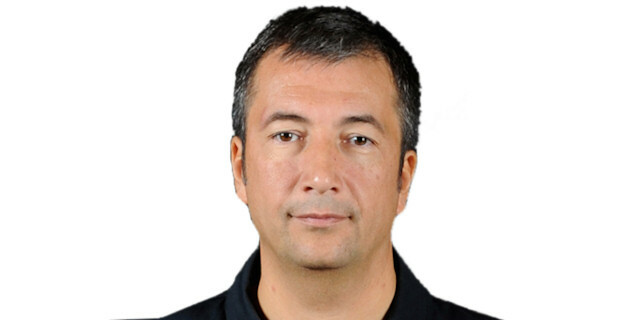 Sloukas made free throws and Spanoulis finished a long, two-chance Olympiacos offense with a layup-plus-foul that gave the Reds a 61-68 lead with less than two minutes to go. Janning struck from downtown and Moss copied him from the left corner to make it a 67-68 with 31.8 seconds left. Law missed from beyond the arc, but Montepaschi could not get a shot up in the game's final possession and Olympiacos walked away victorious. 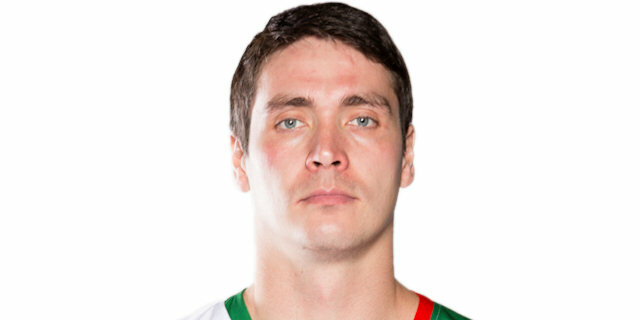 "The last quarter was not so good for us, also because we were really tired. But we have to be proud of our team, which tonight competed against a very big team like Olympiacos. Now we have to try to win in Istanbul, obviously the game tonight makes me look with confidence to the future." "It was a tough game. It was the step that we wanted in the Top 16. We want to go as far as we can in this competition and it was a very crucial win in this very difficult court. Our defense in the third and fourth quarters was excellent. We lost Printezis in practice and that means changing something in our way to play, but we took a very important win. " "The key moment in the game came in the fourth quarter, when they started to make some shots and we went from up 5 to down 6 and in situations like that is very tough to come back. Now in Besiktas is another key game for us and we have to try to win on the road to move on." "This loss is really bad for us, but there is nothing we can do now and we have to think about the future. I think that we had some problems in offense, but also we gave too many offensive rebounds to our opponents." 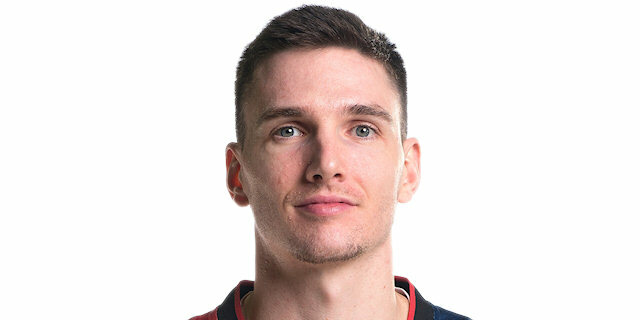 "It was a very tough place to play, especially because they play really well here. We were down by 10, but we came back fighting and we got the win."